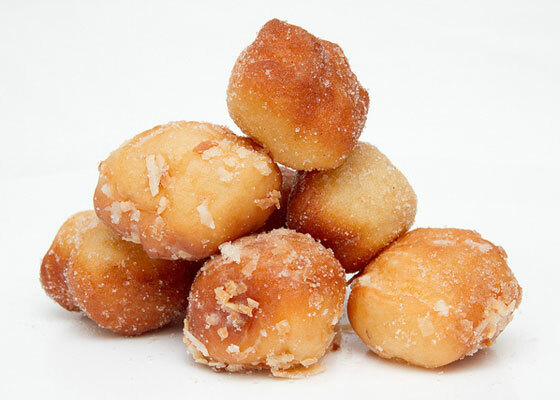 There has been different kinds of fried dough treats in many cultures but the kind that we think of as donuts probably began with “olykoeks” (oily cakes) that were brought by Dutch immigrants to New Amsterdam (now New York). (You have to admit that donut is a much tastier sounding name than oily cake!) These early donuts were round balls of fried dough, similar to today’s donut holes. These donuts had to be small because the dough in the middle takes longer to cook than the outsides. If it’s very large, the outsides get too browned while the middle is still gooey. This problem was solved by stuffing the middle with nuts, hence the name “dough nut”. Someone figured out it was more practical to cut out the middle instead. Legend has it that this was Hanson Gregory, a ship captain who was either cheap and wanted to use less dough or was practical and wanted to be able to skewer them onto the ship’s wheel to keep them handy. 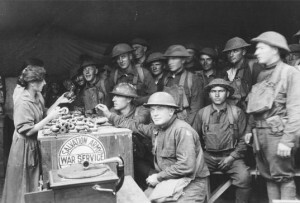 During World War I, women volunteers from the Salvation Army brought donuts to the soldiers serving in France. When the soldiers came home, they brought their taste for the treats with them. In 1920 a Russian immigrant invented a machine to automatically shape the donuts into the ring shape we’re familiar with. This made it more practical for bakeries to make them and donut shops became popular. In 1937 the first Krispy Kreme opened. Dunkin’ Doughnuts followed about a decade later. 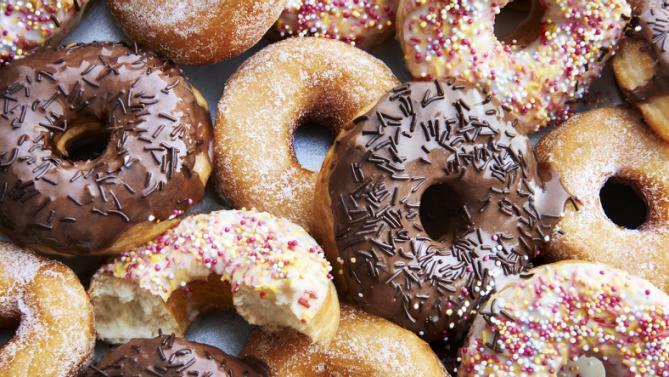 Both companies are offering free donuts today to celebrate National Doughnut Day. Dunkin’ Doughnuts is offering a free classic glazed donut with any beverage purchase. Krispy Kreme is offering a free donut of any of their varieties at their locations in Australia, Bahrain, India North, KSA, Kuwait, Puerto Rico, Qatar, Turkey and UAE. They’re also offering samples of their original glazed donuts in Japan and South Korea. Entenmann’s has a sweepstakes on their Facebook page where you can win a year’s supply of free donuts. And don’t forget to check #NationalDoughnutDay on Twitter or Facebook to see if any of your local donut shops have specials today. Previous PostFirst Woman Runner In the Boston Marathon?Next PostPony Express?